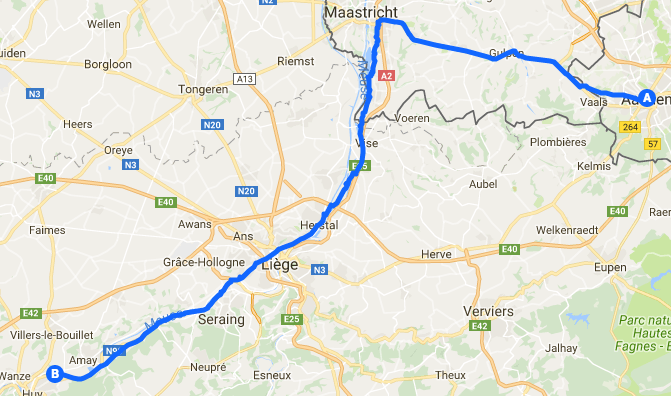 On sunday the 25. of June 2017 there will be a tri-national 90 km human-chain starting at Tihange, passing Liège and Maastricht and ending in Aachen. With this action we the initiators from Belgium, the Netherland and Germany claim together with ten thousands of people the immediate shutdown of the nuclear power plants Tihange 2 and Doel3. A human chain is formed by thousand of people which stand in a line and hold hands. At the tri-national human chain action on the 25. June 2017 we will form a band through the countries Belgium, the Netherlands and Germany. At the moment of the closure of the human chaine we will hold hands through the borders and different languages to symbolize the common protest against the nuclear power plants Tihange 2 and Dooel 3. To bridge gaps in the human chaine there will be “chain-ribbons” (1 m of textile) to fill the gaps. But you can also be creative and bring your own (self-made) banner with you.First of all: The human chain should be fun! Therefore organize yourself and do pick nick with your family, friends and groups before and after the chain closure, make music, sing songs against Tihange and Doel and generally against nuclear power and initiate (chain-) games.The tri-national human chain from Tihange through Lüttich/liège, Maastricht to Aachen will be mostly in the Netherlands and Belgium. In Belgium the chain will be located in the nice Maas valley. All routes of the human chain will be blocked by the police during the action. At which time is the human chain? The human chain is formed by the people along roads and paths between Tihange, Liège, Maastricht und Aachen. The human chain starts simultaneously at 2 pm at the complete on the entire 90 km human chain. The action will take maximum 2 hours. During that time the “chain connection” will take place. Where is my position in the chain? The chain symbolizes the common protest from different European countries and languages. Therefore, the chain is constructed in such a way that in each section people from different nations are gathered together. We split the entire route in 1 km sub-sections. Each participant will allocated on one of this sub-sections determined by his or her place of residence. People who participate as part of a group should choose one joint reference place. This could be the location of your club house or the location of your common workplace. For the success of the human chain, we request all participants to join the chain at the sub-section which is allocated to your place of residence. You can find the subsection which is related to your place of residence by looking on the following lists. You place of residence is in Germany look on this list. Your place of residence is in The Netherlands look on this list. Your place of residence is in Belgium look on this list. Your place of residence is outside these countries look on this list. How do I get to my subsection? Depending on the distance to your position in the chain and your place of residents we suggest you the following kind of transport: 1. by foot 2. by bike 3. in car sharing pool with your friends, your groups (parking lots will be arranged next to the route) 4.) with your private bus that you can organize with your group 5.) with local public transport: Because of expected high appearence of traffic on the 25. June we recommend you not to use the local public transport. Because of the high appearence of traffic we recommend you to calculate the double time for the travel to your position in the human chain. You want to be part of the human chain? Register here. Only together we can make the human chain become a reality.